I made this illustration a few years ago, but never managed to put it together into a book cover or poster. Sometimes it can be hard for me to marry something I've drawn with type. Maybe I'm too close to it, but I often feel the cold, vector lines of a font just don't gel with my clearly hand-drawn illustrations. 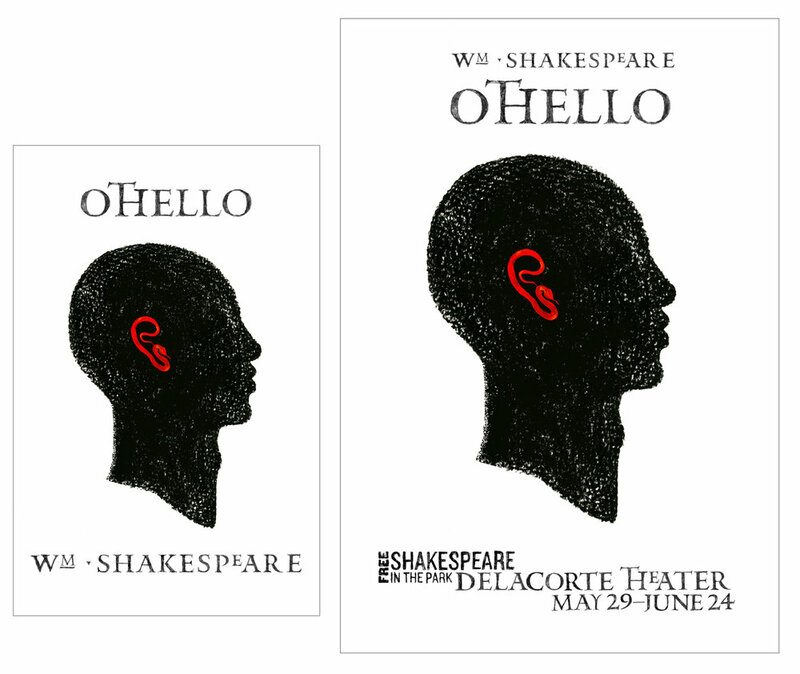 When I saw that The Public Theater is putting on Othello this season at Shakespeare in the Park, I thought I would dig it up and give it another try. Book cover on the left, poster on the right. But you knew that already. Of course, my answer was very simple: trace the font by hand so its sharp edges won't contrast against my drawn edges. Why didn't I think of that before? Since Othello takes place in Venice, and the original on which Shakespeare based his play is from the mid 1500's, I chose Mantinia for the font because it was based on the letterforms of Andrea Mantegna, an artist of the Italian Renaissance. It doesn't hurt that it's exquisite and has enough personality to hold its own with a minimalist illustration. For the illustration, I took the idea of a classical bust since Othello is described as noble, and is fêted for his military successes. The important change being that Othello is, of course, a Moor. By and large, most of those classical portrait busts are of white men (I can only think of a few specific portrait busts of POC) and are carved in white marble, so drawing him this way highlights his difference. I used charcoal to draw his profile to emphasize that as well. I thought a minimalist approach, with the simple profile on a white ground, would highlight it even more. When Iago schemes against Othello, he says that he will "pour this pestilence into his ear," so the ear was already a feature that I knew would be important. To imagine Iago, or perhaps his innuendo, as a snake, and then to make the snake into Othello's ear was a quick visual jump. I learned a lot doing this—mainly to never throw out something I think I'll never finish!